Schematic Skew-T soundings can be used to estimate the depth of elevated mixed layers and their origins thousands of kilometers downstream from their source regions. Focus is on the elevated mixed layer from the Sahara, the Saharan Air Layer (SAL), and its relationship to aerosol optical depth. 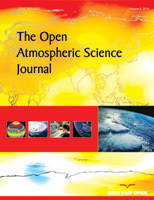 Aerosol optical depth (AOD) measurements and SAL depth determined from atmospheric soundings were tabulated for five summers at three sites located downwind from the Sahara (Miami, Barbados and St. Cruz, Tenerife). These data are analyzed to show a site-specific relationship between the depth of the SAL and the AOD, the deeper the SAL the larger the AOD. The frequency distribution of SAL depths is also discussed. Keywords: Aerosol transport, Aerosol optical depth (AOD), Ecological Monitoring, Elevated mixed layers, Saharan air layer depth (SAL).